The Site has been substantially redesigned with a lot of new content recently, if you entered from a search engine or bookmark to a particular page it's possible you have missed the new section, to visit it, please go to the Intro Page and navigate from there. If you wish to return to this old site there are links available in a menu on the right of the new pages, which when clicked will show the full listing. From the four pieces of cill discovered, there are enough sockets to determine the spacing of the mullions, assuming one vertical bar per opening, this gives a distance of 20 inches, centre to centre between mullions, with a free opening 8 inches from the face of the mullion to the vertical square section bar in the centre of the opening, giving an overall window opening width of 16 inches. There are no signs of any fixed glazing of any description, therefore it seems probable that they were open to the elements, with only a bar to prevent access. 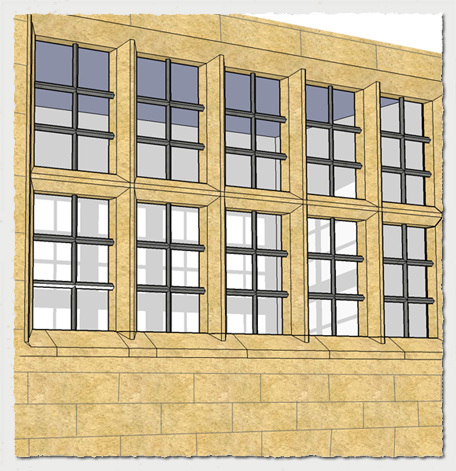 The illustration above is one possible view of each cill section and the window opening associated with it. 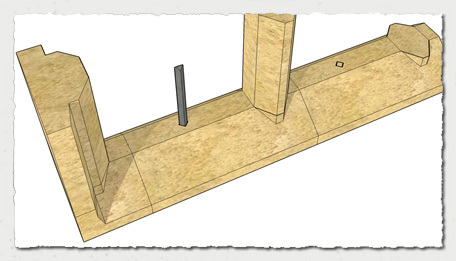 It is possible that the overall window was made up of a number of the cills and respective mullions and jambs to form a composite window, below is a second alternative. The second illustration, which I might add has taken lots of time to produce, is, I believe, the most likely style of window, made up of the various cill pieces discovered. 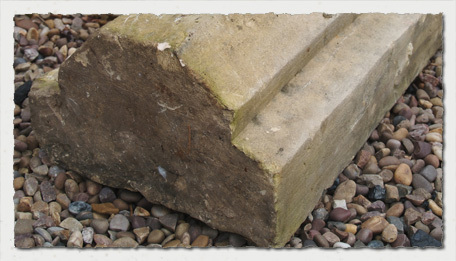 The reasoning behind this declaration is that whilst drawing the piece it was apparent that the jambs had a distinct familarity, the section which developed as the cill and jamb junction detail was explored was virtually identical to a piece of stone found earlier when clearing the ground near the stairway to the cellar, [pictured below]. 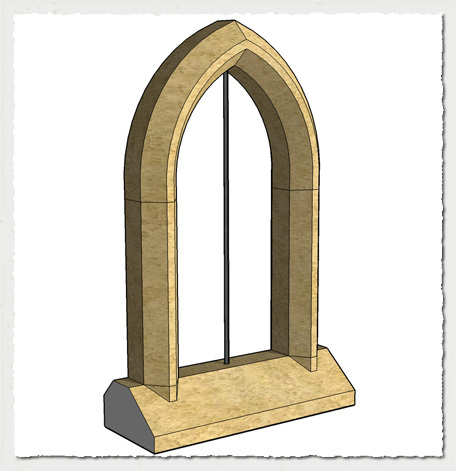 The half octagon shaped face is a match for the dimensions of a mullion. The exploded view of the junction between the cill and jamb shows how the stonework was formed, sadly the corner stone has not been found, more digging required! All the work reproducing how the window may have looked, sadly cannot be verified by any evidence from the photographic records available nor from the plan drawn in 1885 by the Architect Fowler Jones. The style of window without glazing makes it very difficult to place, so it will remain a mystery! 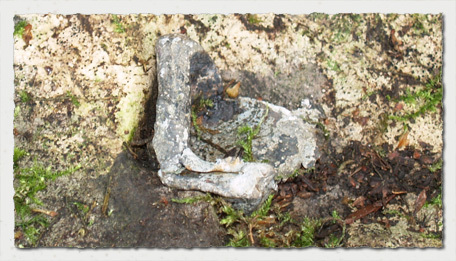 The puzzle of these pieces of stonework may have been solved following further investigations into other local structures. Firstly a re-visit to the remains of the Folly on the island formed by the former lake which lies near to Garforth Golf Course, click here for a plan of the lake. The Folly is in the area marked A and is the open ended box shape. 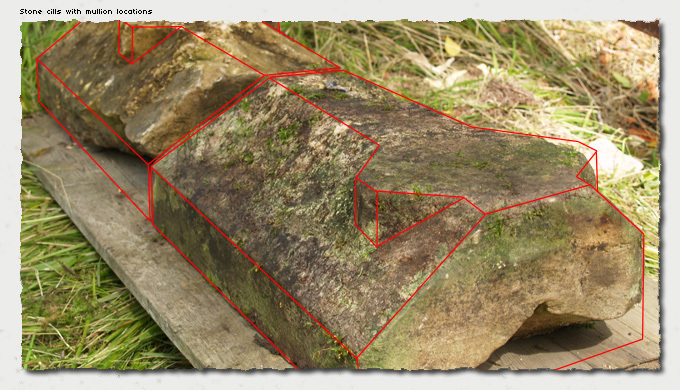 The window jambs and cills are clearly the same as those found at Parlington. Parlington was greatly modified during the many centuries it served the Gascoigne family, the materials used reflect trends of the respective times. The two pricipal blocks forming the main south elevation, although built in different styles were both in limestone ashlar. The west wing and stables were of brickwork, parts of which were rendered. The Main Entrance Portico [Shown above] was also ashlar but out of sandstone. Some of the oldest section, which overlooked the Kitchen Yard, a cobbled area bounded by various outbuildings, [the paving still remains], was built in rubble walling with arch headed windows and jambs in smooth faced stone. A picture of the pump and window of the Servants Hall, taken in the late twenties or early thirties, but not available for publication, shows the heavily weathered stonework and the coursed window surround in smooth stone, a great example of a similar arch is the fireplace in the old pub in the centre of Aberford The Arabian Horse .